There are only two residents of pianist Michael Wolff’s Greenwich Village household you might not ask for an autograph. One is E.T., the family’s appropriately named French bulldog. The other is Wolff himself, who, despite a five-year, high-profile stint as Arsenio Hall’s Los Angeles-based bandleader, doesn’t quite have the star quality of his actress-director-producer-wife Polly Draper or his sons Nat and Alex, who are featured on Nickelodeon’s cable-TV hit The Naked Brothers Band. 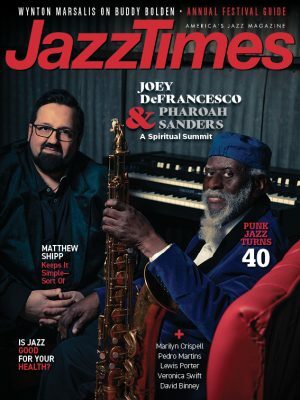 For Wolff, raised the son of a Jewish doctor in Memphis and New Orleans, this is a far cry from what he first experienced as a young musician settling in Manhattan in the 1970s. Wolff’s scuffling days in New York eventually led to a gig as Nancy Wilson’s musical director, during which he roomed with a comic named Arsenio Hall, who was her opening act. The two bonded and the young Hall offered that if he ever made it big, Wolff would be his bandleader. He was right and the Hall gig introduced Wolff to Hollywood and, in 1989, the woman who would eventually become his wife. Draper starred in the television series Thirtysomething. 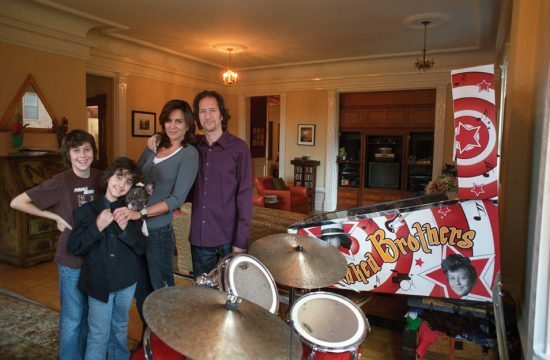 The living room of Wolff’s large but unpretentious lower Manhattan home features a Naked Brothers pinball machine, a CD jukebox stocked with Beatles tunes, a television entertainment center, some small chandeliers, a Steinway piano, a set of drums and a mini basketball hoop. Talking to Wolff you sometimes have to wonder who gets more pleasure out of all the toys. The things around the house are a reflection of Wolff’s belief that the children should be raised as “normal” as possible. “The kids got into [acting] because they grew up in our household, where they just assumed everybody’s a musician or an actor or something like that. They see Polly either doing a movie or a play or a television show and then she might go away for a couple of weeks. Then mommy comes home, then daddy goes on the road and then he comes back. Or dad’s playing a gig and they come to them,” he says. Wolff has Tourette syndrome, a condition that, depending on severity, can be manifested in uncontrolled physical tics and swearing. In his case, it can be detected in a mild vocal “hmm.” Otherwise, the condition is undetected. His wife, though, saw an opportunity to alert more people to the condition, and thus wrote and produced the movie The Tic Code. “I love Five Easy Pieces,” he said, breaking into an impression of Jack Nicholson. “I love Jack. I like that era of movies, the 1970s, all of those. Alice Doesn’t Live Here Anymore. I love anything that Julie Christie was in. … I just like a lot of old movies.